NASA’s New Horizons team has continued to release their latest high-resolution pictures of Pluto, after the historic flyby over the dwarf planet on July 14. The photos have enabled scientists and everyone to appreciate the best color map ever produced of what Pluto looks like. The cylindrical projection map lets researchers zoom into different locations to see Pluto closely. They have discovered new characteristics of the planet, such as a patch of tangled ridges that reminds of a snake’s skin. John Spencer, a Geology and Geophysics Investigation (GGI) deputy leader from Southwest Research Institute (SwRI) in Boulder, Colorado, was also fascinated by the formations. 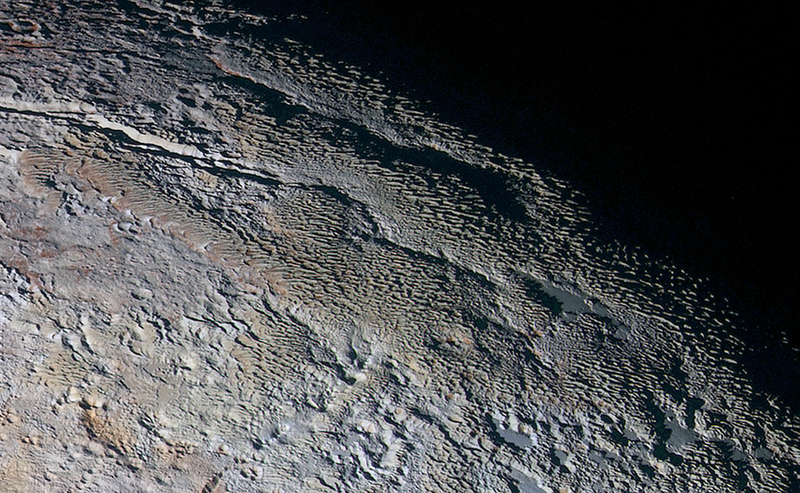 “We used MVIC’s infrared channel to extend our spectral view of Pluto. Pluto’s surface colors were enhanced in this view to reveal subtle details in a rainbow of pale blues, yellows, oranges, and deep reds. Many landforms have their own distinct colors, telling a wonderfully complex geological and climatological story that we have only just begun to decode,” he said. From this time on, scientists are sure these new images and maps open the door to a new opportunity for revealing Pluto’s history. These new findings are a crucial point in resolving how the planet works. New Horizons, which is currently plunged into the deeper Kuiper belt, will keep on sending high-resolution images back to Earth. For instance, it has also shown regions that scientists already had discovered, such as the Sputnik Planum. This area is located deep inside the western side of the famous heart-shaped Tombaugh Region and was captured by the spacecraft with intricately stunning detail. What they found is perhaps various clues of some sort of diurnal weather cycle. “Once we are able to tear open the haze, we will be able to observe that it appears brighter in the evening sky rather than the morning sky,” said New Horizons researcher Alex Parker.